Many condiments — guacamole, sour cream, salsa — taste good on fish tacos. When mangoes are in season, I like to serve this with mango salsa; when pressed for time, however, I substitute a prepared fresh salsa purchased from the store. If you have leftover sauce and cabbage, toss the two together to make a quick slaw for another meal. Prepare the fish marinade by combining the fresh lime juice with the vegetable oil and soy sauce in a rectangular glass or ceramic dish. Add the fish, turn to coat, and leave to marinate while you prepare the rest of the ingredients. Prepare the chipotle-lime sauce by combining the mayonnaise, yogurt, sour cream, lime juice, chipotle chile, and chopped garlic in a bowl. Season to taste with salt. Remove fish from the marinade and grill or sauté until cooked through. Warm the tortillas (see Note). Set out individual bowls of the sauce, salsa, and shredded cabbage. 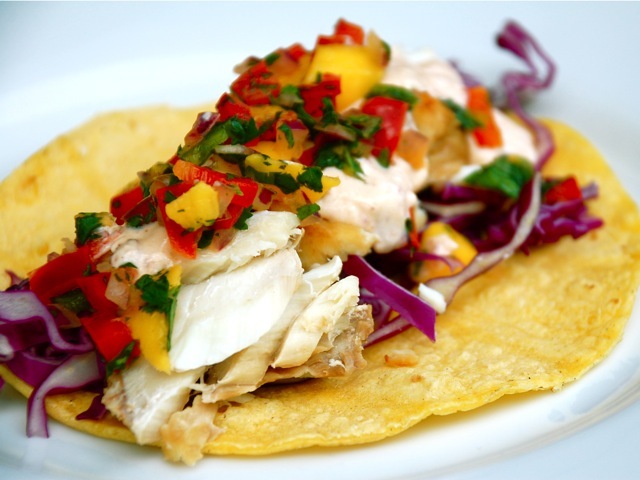 For each individual taco, place some of the fish (breaking off chunks of the cooked fillets) on a tortilla, drizzle with the chipotle-lime sauce, and top with cabbage and mango salsa. Although I like the taste of tortillas fried in oil, I don't like standing over the stove or the extra fat. To steam 4 to 6 tortillas at a time, wrap them in paper towels and cook them for 30 to 45 seconds in the microwave. To steam all of the tortillas at once, follow a method I picked up in one of Rick Bayless's books: Place a vegetable steamer in a pot over a half-inch of water, cover, and bring water to a simmer. Wrap the tortillas in a thick, clean dish towel, and place them in the pan on top of the steamer. Cover the pan and steam the tortillas for 1 minute. Turn off the heat and leave the tortillas in the covered pot to steam for 10 minutes.